Rich flavour, vibrant colour and heady aroma are what food from the Indian subcontinent is characterised by. Its true beauty lies in its versatility; making it fit for a feast on a special occasion, or just a simple weekday meal to comfort the taste buds and satiate the soul. You are bound to attain food enlightenment here, given its royal décor and lip-smacking fare. Expect to be bowled over by a variety of kebabs, creamy curries and robust biryanis, all mildly spiced to adapt to the global palate. Live music adds to the experience. This one is a treat, being the first-ever restaurant in Bahrain run by a Michelin-starred chef. Vineet Bhatia’s concept is innovative, from the ambience to the food. Complex, layered, fusion flavours that successfully retain their unique ‘Indian-ness’ are presented in the most artful way to wow the senses. The restaurant serves Indian fusion cuisine alongside Arabic specialities. The high-ceilinged venue dressed in gold and maroon will put you straight into the mood for creamy curries and spicy delicacies. This eatery sports a sober ambience and serves food that is loud enough to claim your undivided attention. The chefs grill meats and air-swirl flatbreads in the display kitchen as you anticipate the arrival of your food. Don’t forget to taste the kulfi for dessert! This restaurant has been around for many years, offering the busy executives of Manama a perfect excuse to take a break with a contemporary, Indian dining experience. Its also a popular weekend jaunt for Indian food aficionados and enthusiasts. This award-winning restaurant chain has made its presence felt in Budaiya, Adliya, Juffair, Amwaj Islands and Riffa. Along with the quintessential Indian thali meal, lavish buffets, hearty breakfasts and extensive à la carte options, Lanterns has an interesting décor, which, like its food, is far from bland. Tucked away in a corner of predominantly residential Umm Al Hassam, this place has long been a favourite with locals and expats alike for its cosy environment and tasty grub. Little details like the ornate copper dishes and warmth of the staff keep patrons loyal to this island institution. Making a bold statement with its locations at City Centre Bahrain and The Avenues – Bahrain, Asha’s is characterised by mood lighting, eloquent artwork and rich flavours that span the subcontinent. Do give the mocktail menu a look-see. Located within the bustling bylanes of Exhibition Road, this venue offers tradition on a plate. Gorge on culinary specialities from Kerala served on a banana leaf, either within a typical houseboat-style interior or that of a temple courtyard, depending on where you choose to sit. It doesn’t get more authentic than this. This restaurant in Juffair’s Al Raya mall has been commended for its food quality, taste and service standards. Worth a visit if you’re in the vicinity and crave a decent Indian meal. This small eatery, which is part of a larger restaurant chain in India, has been a longstanding fixture along American Alley – Juffair’s popular food hub. Although limited in space, it’s big on flavours. Moti Mahal has a wide range of vegetarian and meat options, to suit everyone’s taste. A relative newcomer, Juffair Gate has taken over the space vacated by Bambu and offers a good quality menut at reasonable prices over the far side of Alidya. 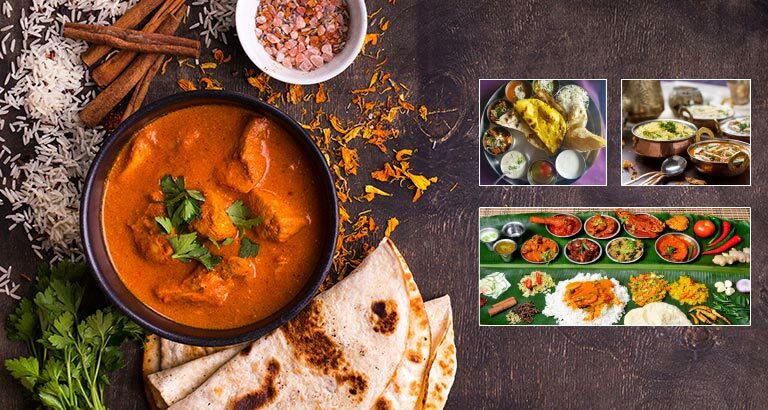 Bombay Restaurant, close to the Gold Souq in Manama, Vrindavan and Central Café on Isa Al Kabeer Avenue, Mumbai Spices in Adliya and Govinda’s in Juffair are all no-frills quick stops that serve simple Indian dishes, with a focus on breakfast, evening snacks and street food. The popular favourites will keep your stomachs full and pockets light.